Allergic? You Can Keep Your Cat! Being allergic doesn’t necessarily mean you can’t have a pet or that you must give up the one you already have. You can solve this problem by learning more about minimizing pet-related allergies and making some minor adjustments to your environment. Controlling allergies takes some work, but if you really want to…YOU CAN DO IT! , hair follicles and saliva. Dander–a naturally-occurring combination of skin cells and saliva that the pet is continually shedding–is most often the cause of pet allergies. It is the protein of this dander that causes the reactions. Dander imbeds itself in the carpeting, furniture and draperies and remains in the environment to cause reactions. “Fel d 1”, the cat allergen, is the major cause of allergic reactions to cats. During a cat’s self-cleaning process, Fel d 1 protein in the saliva is deposited on the fur. It is also produced by sebaceous glands–the skin glands that secrete the oils that keep the skin and hair sleek and shiny. 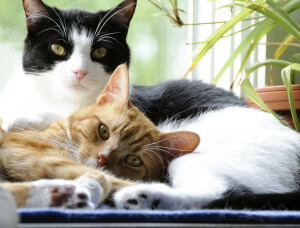 Un-neutered male cats usually produce more allergen than females. 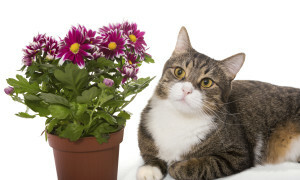 Proteins in the urine of cats will also trigger allergic reactions. Some animals seem more tolerable than others because they shed fewer allergens. Unfortunately, there are no non-allergic animals. It is also true that the length of hair does not alter the animal’s allergenicity. Within any given breed, or even litter, you may find animals that you can tolerate better than others. Allergies are usually cumulative. Since the allergic person is sensitive to more than one thing, it is the Total Allergen Level that causes a reaction. Whether or not a person has symptoms depends on how many allergens are in the environment at the same time. An individual who is allergic to animals may exhibit no noticeable symptoms when the total exposure is below his allergy threshold level. The trouble begins when there are enough allergens in the environment to exceed this level. The goal is to minimize exposure to airborne allergens that exceed tolerance thresholds and trigger attacks.